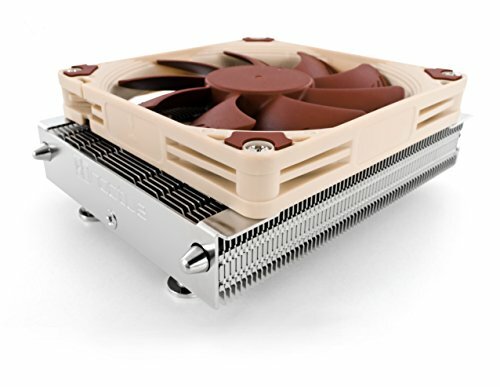 The NH-L9a-AM4 is the latest, AM4-specific revision of Noctua's award-winning NH-L9a low-profile CPU cooler for AMD Ryzen-based HTPCs and Small Form Factor (SFF) systems. At a height of only 37mm, the NH-L9a is ideal for extremely slim cases and, due to its small footprint, it provides 100% RAM and PCIe compatibility as well as easy access to near-socket connectors even on tightly packed mini-ITX motherboards. The custom-designed SecuFirm2 mounting system for the AM4 socket makes installation child's play and, thanks to the highly optimised NF-A9x14 92mm fan that supports fully automatic speed control via PWM, the NH-L9a-AM4 runs remarkably quietly. Topped off with Noctua's renowned NT-H1 thermal compound, the NH-L9a-AM4 combines everything users have come to expect from Noctua's larger coolers into a super-compact, premium-quality package for ITX and HTPC builds with Ryzen CPUs or APUs. Caution: The NH-L9a-AM4 is a highly compact, quiet low-profile cooler designed for use in small form factor cases and HTPC environments. While it provides first-rate performance in its class, it is not suitable for overclocking and is only recommended for CPUs/APUs with up to 95W TDP (Thermal Design Power). Please consult our TDP guidelines to find out whether the NH-L9a-AM4 is recommended for your CPU/APU.